The PowerSelect series give you serious power over your shower experience by letting you experience the high-pressure flow through several unique sprays. The patented Oxygenics technology amplifies water pressure and provides a wide coverage, which makes it feel like you are using more water, but you really use much less than a standard shower head. With a click, easily change your shower scene from a soothing rain shower, an invigorating oxygen spray or a relaxing massage. And the SmartPause setting holds back the flow and keeps it warm - perfect for conserving water while you lather. Oxygenics PowerSelect Fixed, Hand-Held or Combo Showerhead! The luxurious Oxygenics PowerSelect has 7 8 unique spray settings, allowing for a fully customizable shower. And by using the responsive Intellever, a new spray is only a simple finger flick away. Low pressure and a single mundane setting are a thing of the past. Increased water velocity + air induction = MORE PRESSURE. The patented Oxygenics technology ensures an invigorating pressurized shower spray regardless of water pressure. Oxygenics showerheads infuse more oxygen into the water stream through use of their patented technology that continually introduce air into the shower water creating a powerful oxygenated spray. In fact, Oxygenics showerheads can increase oxygen content in your water by up to 10 times! 7 Spray Settings – 7x the Performance - The seven-spray PowerSelect harnesses the power of Oxygenics technology into seven distinct spray settings. The unique geometric face shape, along with the responsive Intellever, allows you to switch between the sprays effortlessly. SmartPause setting holds back the flow and keeps it warm - perfect for conserving water while you lather. Pressure Increasing Technology - Increased water velocity + air induction = MORE PRESSURE. The patented technology ensures an invigorating pressurized shower spray regardless of water pressure. Easy Intellever to Change Spray Patterns - Switching between the sprays is effortless. Simply press lightly on the Intellever and the sprays transition seamlessly into one another for the ultimate shower experience. Eco-Friendly and Economical - The PowerSelect is designed to be eco-friendly and economical, saving up to 70% in water and energy consumption compared to traditional shower fixtures. Thousands of gallons of water can be saved each year which means significant energy and money savings. No Clogging – Zero Maintenance - The internal components are made of Delrin® - a material similar to Teflon® which increases durability and eliminates clogging, mineral buildup and corrosion. No cleaning required — install it and forget it! Guaranteed For Life - The Oxygenics PowerSelect comes with a lifetime performance warranty against clogging. It's guaranteed not to clog – EVER. 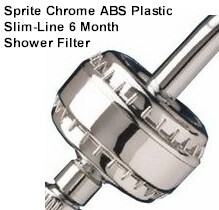 Add a Sprite High Output (1 year filter) or Slim-Line (6 month filter) Shower Filter with patented Chlorgon filtration media to your Oxygenics Shower Head for the ultimate shower experience.